One of the main downsides to a credit card balance transfer is the fact that a balance transfer fee is typically charged. This fee is generally 3% of the amount transferred, so it can add up quickly. Fortunately, there are lots of no fee balance transfer cards available, but if you get creative you can make your balance transfer free by taking advantage of certain credit card offers that come with opening bonuses. 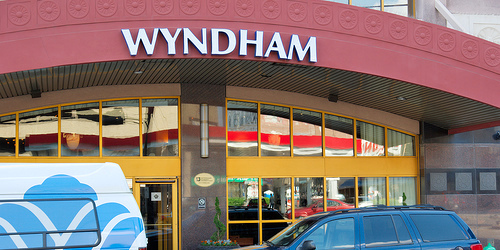 One such offer presents itself via the Wyndham Rewards Visa Signature Card, which is currently providing a $25 statement credit after your first purchase or balance transfer and 0% APR for the first 15 billing cycles on balance transfers that post to your account within 45 days of account opening. Let’s forget about purchases and focus on the balance transfer portion of the deal. Specifically, you need to make that first balance transfer within 30 days of account opening to earn the credit. They say it should “post” to your account within that time, but it doesn’t specify a minimum transfer amount. So once you open the Wyndham Rewards Visa Signature Card, or preferably while filling out the card application to avoid any potential delays, you can simply request a balance transfer from another one of your cards and wait for it to post. Once you do, the $25 statement credit should appear at the close of the first billing statement in which the balance transfer posted. This offer is only good for new cardmembers by the way, and the card is offered by Barclaycard, so the credit card debt must come from a different issuer. Depending on How Much You Transfer It Could Cost You Nothing! Anyway, once you execute your balance transfer, you’ll receive a $25 statement credit. As I mentioned, there’s no specific minimum transfer amount tied to the offer, but the credit card application itself specifies a minimum transfer amount of $100 and a maximum of $20,000. Now let’s assume you’ve got $750 in credit card debt over at Discover that is subject to APR close to 20%. Instead of paying those costly finance charges every month, you can transfer it to the Wyndham Rewards Visa Signature Card and enjoy 0% APR for 15 months. You will have to pay a 3% balance transfer fee, which in our example would be $22.50. However, that $25 statement credit would offset the fee entirely, resulting in a free balance transfer offer. No cost to you and 0% APR for a very long time. In fact, you’d come up $2.50 in the process. If you transfer a larger amount, such as $1,000, the net cost to you would be $5. Obviously the more you transfer, the more you pay, and the less the $25 will impact the fee. But for those with relatively small amounts of credit card debt this is one way to minimize the impact of the balance transfer fee. In summary, this is a great way to get a better balance transfer deal without having to jump through any hoops. And you get a full 15 billing cycles of 0% APR, which is also one of the longest introductory APR offers out there. Good idea, didn’t even know about this card!